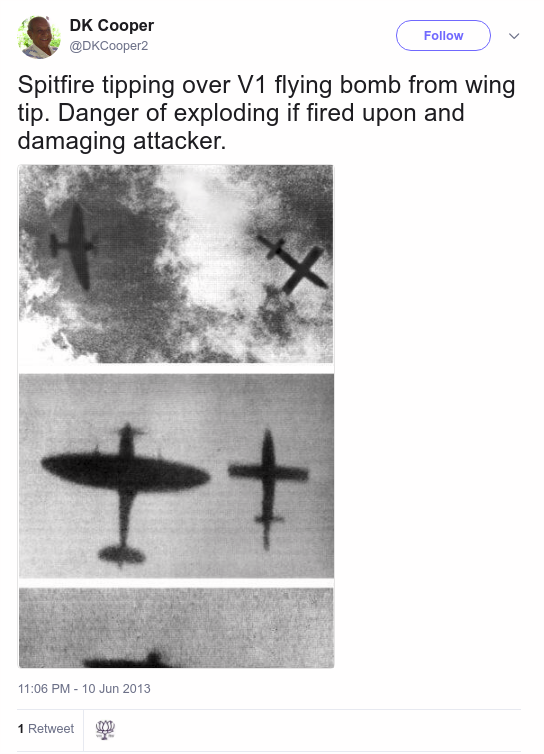 Did a Spitfire Really Tip the Wing of V1? Clarity. What photographic device in this timeframe would have such an aperture let alone resolution? That’s only a quick list to make a solid point this is a fabrication anyone should be able to discount at first glance. In short, when I see someone say they found an amazing story or image on Facebook there’s a very high chance it’s toxic content meant to deceive and harm, much in the same way tabloid stands in grocery stores used to operate. 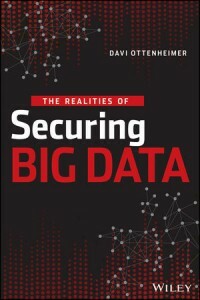 Entertainment and attacks should be treated as such, not as realism or useful reporting. 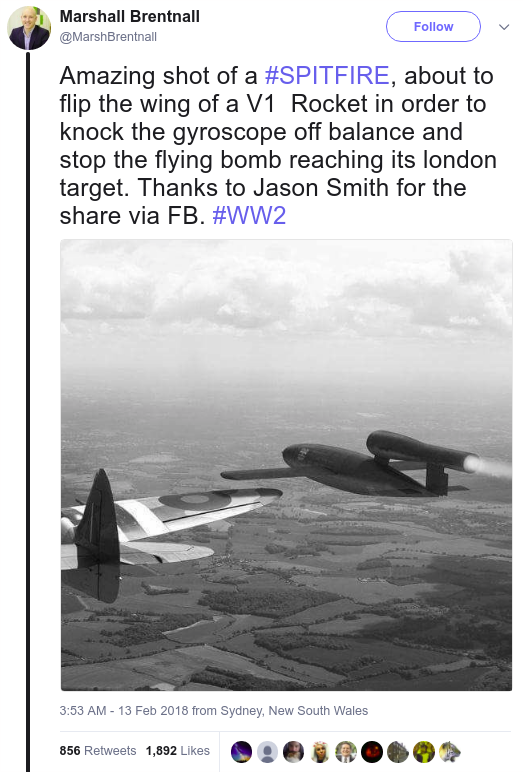 Several years then pass by, and nobody talks about V1 tipping, until only a few weeks ago a “Military aviation art” account posts a computer rendered image with the comment “Part of a new work depicting the first tipping of a V-1 flying bomb with a wing tip. Who achieved this?”. First to physically tip a V1 bomb was Ken Collier, 91 Squadron, in a Spitfire MkIVX. He scored 7 V1 victories and was later KIA. #WWII #WW2. On the bright side the artist answers their own question with some real history, worth researching further. On the dark side the artist’s answer also sadly omits any link to original source or reference material, let alone the (attempted) realism found above in that “IAF veteran” tweet with an actual photograph. The artist simply says it is based on a real event, and leaves out the actual photograph (perhaps to avoid acknowledging the blurry inspiration to their art) while including a high-resolution portrait photo of the pilot who achieved it. 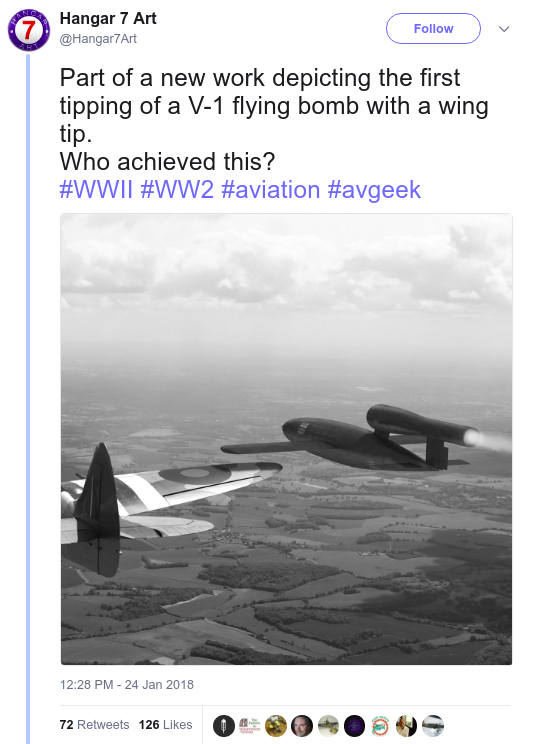 Kind of misleading to have that high-resolution photograph of Ken Collier sitting on the ground, instead of the one the IAF Veteran tweeted of a Spitfire in flight. The more complete details of this story not only are worth telling, they put the artist’s high-resolution fantasy reconstruction of a grainy blotchy image into proper context. 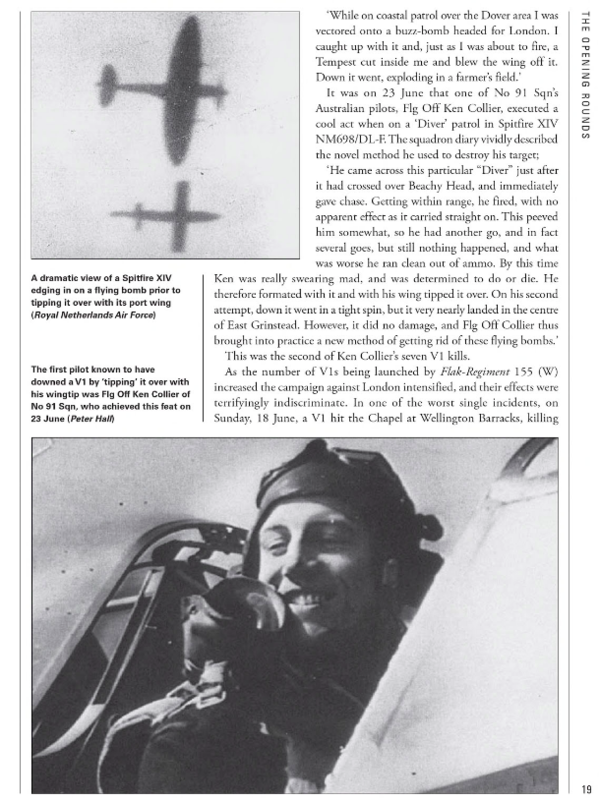 Fortunately “V1 Flying Bomb Aces by Andrew Thomas” is also online and tells us through first-person accounts of a squadron diary what really happened (notice both original photographs together in this book, the plane and the pilot). Does finance guy in Sydney feel accountable for claiming a real event in an artist’s fantasy image? Of course not, because he has been responding to people that he thinks it still is a fine representation of a likely event and he doesn’t measure any harm from confusion caused; he believes harm he has done still doesn’t justify him making a correction. Was he wrong to misrepresent and should he delete his “amazing shot” tweet and replace with one that says amazing artwork or new rendering? Yes, it would be the sensible thing if he cares about history and accuracy, but the real question is centered around the economics of why he won’t change. Despite being repeatedly made aware that he has become a source of misinformation, the cost of losing “likes” probably weighs heavier on him than the cost of damaging integrity.